There is a lot going on behind the scenes for our Decade Celebration - here are some things for your enjoyment! 1. We will hold the event at Clayton Hall on Rt. 896 at the University of Delaware. This is a beautiful venue with plenty of parking, a huge open area where several hundred people can fellowship peacefully - comfortable chairs and sitting areas that will be very enjoyable between services. 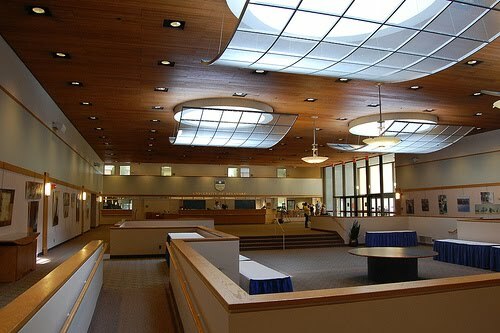 Our two services will be held in a modern 500 seat auditorium that will also accomodate our multi-media presentations. We have reserved two large rooms for child care and will be hiring faithful ladies from other churches to watch our children during the services. Across the expansive common area is a huge banquet hall that we will use for a delicious formal lunch. All the services will be packed with excellent content, media presentations, preaching, special presentations, etc. We are nearing completion of the LBC Decade Celebration History Book entitled: From Humble Beginnings to Joyful Ministry This book tells the story of God's Sovereign birth of Lighthouse through the events that have brought us to joyfully serving the Lord today. You will weep when you read about lawn chairs and shout when you remember the Lord delivering the Sears Property. You will muse on treacherous times of decisions and see the Lord gently leading through it all. We have invited nearly everyone that had something to do with Lighthouse in the past. We have contacted old pulpit supply, missionaries, former members, etc. All are welcome with open arms! There will be a special blessing in the Celebration Service as area Pastors and old friends bless the Lord on our behalf with testimonies of praise. Lord willing, we will unveil an original Lighthouse Hymn written for our 10th Anniversary. It should be a tremendous time to Celebrate the Lord's work. The Scriptures say: Psalms105:1-2 O give thanks unto the LORD; call upon his name: make known his deeds among the people. (2) Sing unto him, sing psalms unto him: talk ye of all his wondrous works. Lighthouse Baptist Church is truly a work of the Lord alone and on 10-10-10 we should celebrate wholeheartedly all that He has done for us.